Astigmatism is a type of refractive error of the eye. It is not a disease of the eye. Rather, it is simply a problem with how the eye focuses light. Other types of common refractive errors include nearsightedness (myopia) and farsightedness (hyperopia). 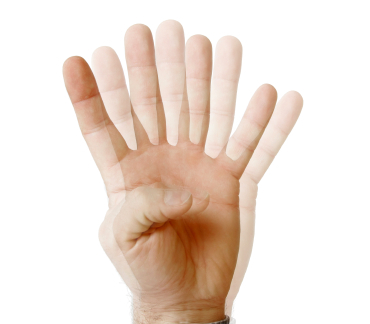 Frequently, astigmatism and nearsightedness or farsightedness affect one or both eyes simultaneously. Clear and crisp vision is created by how different parts of the eye bend or refract light that passes through them. The process of refracting light to achieve perfect vision starts at the front part of the eye with the cornea. The process continues as light travels through the lens of the eye and ends with light properly focusing at a single point on the retina located at the back of the eye. In an eye with astigmatism, there is an irregular shape of either the cornea or the lens of the eye. This irregularity makes it difficult to focus light precisely on the retina. Instead, light comes to a focus either in front of the retina or behind the retina, resulting in distorted vision. Astigmatism usually will cause blurred vision in objects being viewed at both far distances in close proximity. The cornea is the clear, rounded-dome part of the eye covering the iris and the pupil. In a normal eye, the cornea is smooth and equally curved in all directions. As described above, this is essential for properly refracting light that enters the eye and creating clear vision. If the cornea has an irregular shape, it will not refract light properly. This type of astigmatism is called corneal astigmatism. Just like with the cornea, the shape of the lens of the eye must be equally curved in all directions to correctly refract light and achieve perfect vision. If the lens has an abnormal shape, it will not bend light accurately. This type of astigmatism is referred to as lenticular astigmatism. Similar to nearsightedness and farsightedness, astigmatism can usually be corrected with eyeglasses or contact lenses. In the past, rigid contact lenses could only be utilized for astigmatism. Now, special types of soft contact lenses called toric contact lenses are available for astigmatism. The appropriate type of corrective lens used for the correction of astigmatism, whether eyeglasses, soft contact lenses or rigid contact lenses is typically determined by the severity of the astigmatism. Surgery is also an option for some people to correct astigmatism, including laser eye surgery (LASIK). 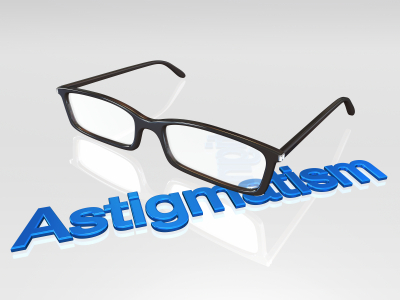 Astigmatism usually causes vision to be distorted regardless of whether the object being viewed is close or far away. The blurred vision from astigmatism may lead to squinting, eye strain and chronic headaches. For adults, these symptoms are easily identified. However, they may difficult for a child to recognize. Astigmatism often occurs early in life. In fact, many people are born with it. Detecting astigmatism early is important for a child not only to identify and correct vision problems but also to help prevent other developmental issues. The American Optometric Association (AOA) recommends infants have their first eye exam conducted when they reach 6 months of age. Testing for astigmatism is one of the reasons why an eye exam is important so early in a child’s life. Double vision, or diplopia, is exactly what the name suggests. It’s a condition that causes you to see two images of the same object. The duplicate images may be seen horizontally, vertically or diagonally in relation to one another. It’s important to understand the basics about diplopia and what double vision may be telling you about your overall health. There are two types of double vision. Monocular diplopia is double vision that occurs in only one eye. The double vision will not subside when the other eye is covered. Binocular diplopia is double vision that is related to both eyes. The double vision will stop when one of the eyes is covered. Astigmatism: An abnormal curvature of the front surface of the cornea. Dry Eye: Insufficient tears are produced to lubricate the eye. Cataracts: The lens of the eye becomes cloudy and less transparent. Swelling of the Eyelid: Swelling in the eyelid may assert pressure on the eye. Keratoconus: The cornea of the eye becomes thin and cone-shaped. Pterygium: The mucous membrane that lines the whites of the eye and under surface of the eyelids (known as conjunctiva) becomes thick. Dislocated Lens: Ligaments that secure the lens in place are damaged or broken causing the lens to wiggle. Diabetes: This disease can affect the nerves that control movement of the extraocular muscles. Myasthenia Gravis: A neuromuscular condition which causes muscles to weaken and tire easily. Graves’ Disease: This disease causes the thyroid gland to become overactive and produce too many hormones. As a result, swelling may occur in the muscles that control eye movement. Strabismus: This condition is commonly referred to as “cross eye” or “wandering eye”. It’s a condition where the eyes deviate or turn when looking at an object. Trauma to Eye Muscles: The muscles that control eye movement can be damaged by some sort of trauma to your face such as being hit in the face with an object or a punch. Double vision can be a signal for a variety of conditions outlined above and many other health problems not listed here. If you or a member of your family experience double vision, it’s important to see your eye doctor. Usually, the double vision can be treated by correcting or managing its cause. Keratoconus is an eye disease in which the normally round cornea becomes thin and starts to bulge into a cone-like shape. When this happens, light entering the eye is abnormally refracted. When the altered light reaches the retina, the result is distorted vision. As the cornea becomes irregular in shape, it causes nearsightedness and astigmatism to develop and progress. It may also lead to light sensitivity. Keratoconus can affect one or both eyes. When keratoconus impacts both eyes, the deterioration in vision can make it difficult to perform daily tasks such as driving and reading normal size print. Keratoconus typically begins in the teen-age years or early 20s and progresses over time, usually reaching its peak by the age of 40. On average, this eye condition affects one in every one thousand people. It is more prevalent in males. While the exact cause of keratoconus has not been specifically identified, research indicates keratoconus may be linked to an imbalance of enzymes within the cornea. This imbalance causes the cornea to weaken and bulge into a cone-like shape. The occurrence of an enzyme imbalance within the cornea may be genetic; it may be a result of the environment; or it may be a combination of both. Keratoconus is also associated with overexposure to ultraviolet rays from the sun, excessive eye rubbing and chronic eye irritation. With the early stages of keratoconus, eyeglasses or soft contact lenses often provide adequate vision correction. As the eye condition advances into more advanced stages, rigid, gas-permeable contact lenses (RGP lenses) may be used to restore clear vision. There are also many types of contact lenses which have been engineered specifically for keratoconus. These types of lenses are typically a blend of both soft and hard contact lenses. In 10% to 25% of people with this eye condition, keratoconus will advance to the point where corrective lenses (either eyeglasses or contact lenses) are no longer effective. At this point, surgery becomes necessary. There are a variety of surgical procedures to treat keratoconus including: placing corneal inserts just under the surface of the eye; procedures for strengthening the cornea; surgical techniques for re-shaping the cornea and; corneal transplants. Eye examinations conducted on a regular basis are a very important part of maintaining optimal eye health and clear vision. Diagnosing eye conditions like keratoconus early helps you and your eye doctor work together to develop the right treatment plan specifically for you and your needs. Visiting your eye doctor regularly also provides you with access to the latest advancements in keratoconus research and treatment. Much work is being done studying this eye condition. Many new tools and techniques are emerging to treat it. Your eye doctor is a tremendous resource for gaining knowledge about these advancements and how they can help you.